I’ve been thinking a lot lately, about love, and dreams, and what it all means. Why do some people work their lives away in a job they hate, just to pay the rent, while others get to have the life of their dreams? Why do some marriages fail after only a few years, others go for decades then fall apart, and yet others can still be going strong after 70 years? I may not know today what goes into a love story such as theirs, but it gives me a lot to think on and strive for in my own life. 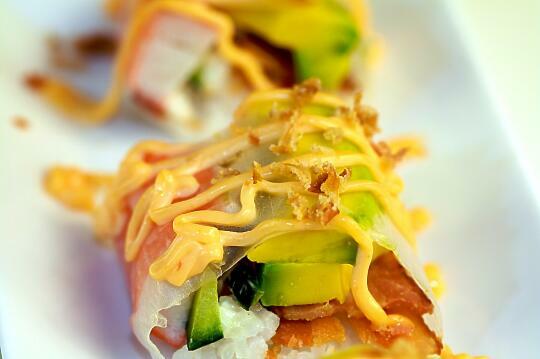 This sushi? Bright, beautiful, and happy, just like my great aunt and uncle. Also, very delicious. Crunchy, smooth, cool, warm, salty, spicy, yum. Slice the cucumber into long, thin sticks. Mix the mayonnaise and Sriracha sauce. 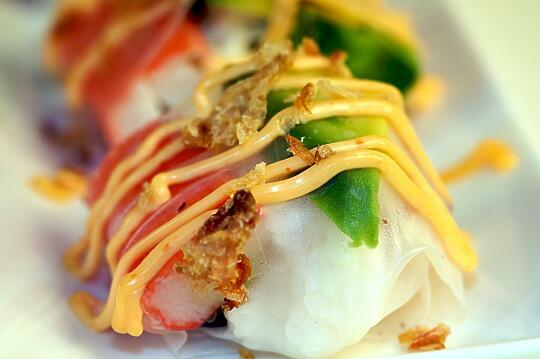 Wet the spring roll wrapper with warm water, making sure to cover every last spot on both sides of the wrapper. Lay the wrapper flat on your workspace. Lay a slice of bacon, a stick of cucumber, some cream cheese, avocado, and a stick of imitation crab in the middle of the wrapper, leaving about 2 inches uncovered on either end. Scoop about 1/3 cup sumeshi onto the fillings, patting it into an oblong shape with either end pointing towards the sides of the wrapper. Fold both sides of the wrapper in, over the fillings. Fold the bottom of the wrapper tightly up over the fillings. Using a sharp knife, slice into 4 pieces. Drizzle with the spicy mayonnaise mixture. That roll description looks and sounds just like everything a good partnership could be. Hm….this may have to be my starter sushi recipe, it LOOKS fantastic. Yep. I have to try that. Wish me luck. Definitely let me know how it turns out for you, and whether you like it or not! 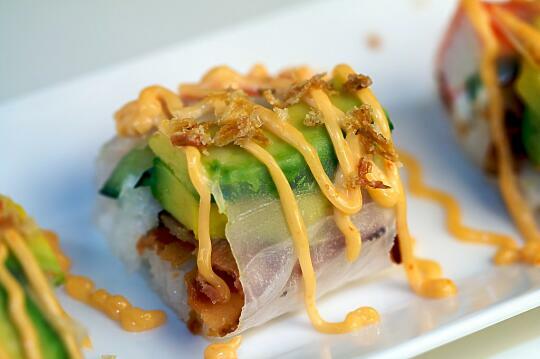 Isn’t it surprising that bacon isn’t incorporated more in sushi? It such a great element both flavor and texture-wise. This looks awesome. I bet those that don’t care for nori would enjoy this roll. What brand of rice paper do you use? I like yours better, the one I have is kind of thick and heavy doesn’t look as clear and thin as the one in the above pictures. Thank you!! Your blog is awesome. I was searching for a sushi blog to get addicted to and this one did it for me. Amazing work. I saw this and was like, omg I have to make my own sushi! lol Is it more expensive to make? or Would you say go to a great all you can eat place?